that posted earlier today, you can click here. It's super quiet in bloggie land today, but if you're like me, you've been outside soaking up the sun and greenery of spring. Ahhhhhhhhh...... I just popped back inside for a drink of cold water and thought I'd go ahead and post this card while I was here. I usually make 5.5" x 5.5" cards but had to go to a 6" x 6" for this one cause the stamp itself is 5.5" wide. It's CAS but you really don't want to take too much away from this bunch of cackling hens. The sentiment comes from AI. I don't have the stamp for it so I just printed it out from my computer and added the Happy Birthday part. Their stamp is a lot more elaborate. Hope these girls give you a laugh when you come in from however you spent your Saturday. I'm going back out to do some weeding and give my car a bath. Which one is you, Tracy?! What a fantastic image and I love how you've coloured them in too - fab papers! I agree, these are some of the most fun images ever and your card is designed so beautifully! Enjoy your warm temps; we're back to cold. I have high hopes it will get warm soon, LOL! Ha! I am coloring this same stamp up in Oregon State U colors today-love yours!! 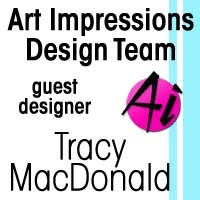 Absolutely love this one, Tracy! You picked awesome colors and papers and the clean design really makes the fun stamp come alive! Fab coloring! How brilliant is that image! Fabulous colouring and I love the sentiment. Gorgeous papers too. This gals make me laugh just looking at them laughing. Love the colours you chose for them and for the background papers. So fun! Oh my gosh...this is great, Tracy!!! LOL! Really love that sentiment, and what a great image! Oh Wow I am loving the wonderful character you have captured here. Awesome design and colouring too. 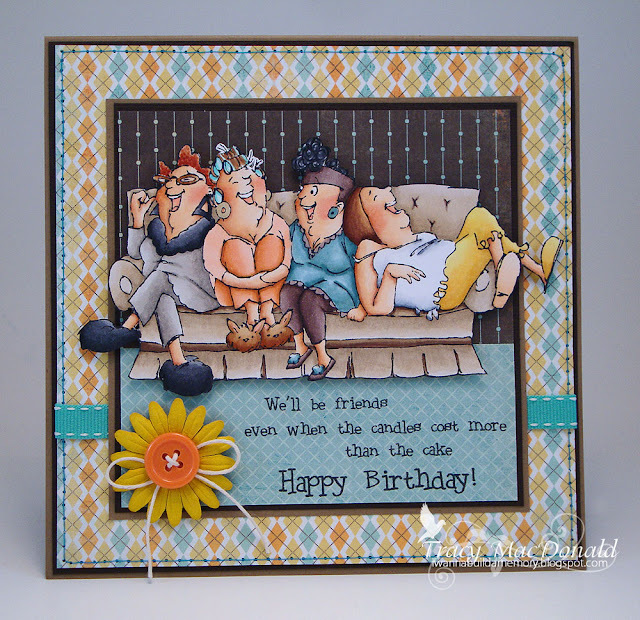 I am really loving the design of this card , it is just so fun, thanks for playing along with us at CCCB! LOL this just makes me smile Tracy...LOVE it :) Enjoy your gardening! LOVE this card, Tracy!! Definitely made me smile! Your coloring just made these 'girls' come alive and really shows their pure happiness! GORGEOUS card!! I can't stop smiling! This is a perfect friendship card. I looked at each one of the ladies, they are hilarious!! Your coloring of the image is superb, and the design perfect as always. Big stamp, but a fabulous card..
Oh Tracy, this card made me laughing immediately, too funny! wow gorgeous card Tracy, and such fantastic colouring - as always! love the card! Tracy, this is just awesome! Love the livingroom with it's bunch of friends! They are such a treasure! What a super card! You have such an eye for color, so beautiful colors in this. I also love the daisy with the button -really cute. Such a funny card, Tracey! I love it and your beautiful coloring! Adorable card, love the sentiment. Fabulous coloring as always! Thanks for playing with us at Papercraft Star! Awe Tracy so good to see you at the Papercraft Star!!!! Those stamps are so funny! This card came out so cute. Love seeing your work! Oh this is fabulous for our challenge at CCCB ... I'm trying to work out which one is me? Lol!! Many thanks for playing at CCCB this week! Wonderful, that really is the best stamp ever, love it! So fabulous, so fun! Love those adorable ladies, and love the scene you made for them. Looks straight out of their living room. Genius! Oh my gosh... I just love this card. That image is too fun.. Love it. Thanks so much for playing along with us over at CCCB! Lovely image and sentiment. And your colouring is fantastic. Oh how fun... love these girls! Gorgeous papers, too! After looking at both cards, I decided this one is my favorite! This image is soooo funny, I have to have it too! Great coloring Tracy, even those tiny details and choice of colors for every clothing item is just perfect! I've had my head up a cupcake the past week and I'm sorry I didn't comment on this earlier!! The rollers and bunny slippers fit me to a T as I am the envy of Wal-Mart shoppers when I arrive..LOL. Awesome card Hick...your sense of humor never fails. LOVE THIS! Congrats on the win at Art Impressions , this card is so awesome , I love your coloring those girlfriends are so fun to color and create with .. Awesome card !! I have this image and love it and I am gobsmacked by what you've done with it! Talk about inspired! !